Sixth album from German metal outfit Iron Savior who show no signs of let up in their approach some four years on from their last offering ‘Megatropolis’. Big riffs collide with chanty anthemic choruses with nary a let in pace throughout. 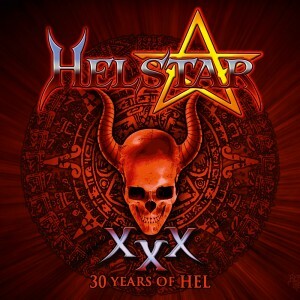 Vocalist Piet Sielck may well sound like the love child of Chris DeBurgh and Blackie Lawless but oddly it works over the enjoyable music, blaring out the speakers with military precision. The aforementioned Sielck also forms a formidable guitar duo with Joachim “Piesel” Küstner who work up quite a sweat throughout but particularly on the likes of “The Saviour”, “March Of Doom” and “Faster Than All” with their fast tempos. More mid-tempo waters are visited on the Accept like timbres of “Heavy Metal Never Dies” (you can envisage the front row head banging in unison here) whilst “Hall Of The Heroes” has an early Queensryche appeal to it and is arguably the highlight. “R.U. Ready” could be seen as a little naff in the lyrics department telling the story of heavy metal (proving that bands do indeed still sing about this sort of thing!) but its infectious riff will draw you in. The album slows for one power ballad “Before The Pain” which is rather forgettable before “No Guts No Glory” sees the album out in stronger style. Clocking in at 47 minutes “The Landing” certainly doesn’t outstay its welcome and is an enjoyable slice of honest rocking metal and comes recommended for further investigation. 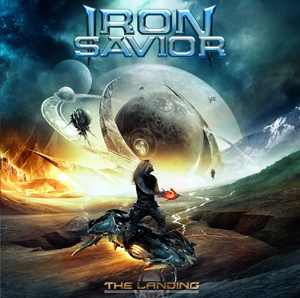 This entry was posted in Reviews and tagged AFM Records, album review, iron savior, joachim kustner, piet sielck, the landing. Bookmark the permalink. 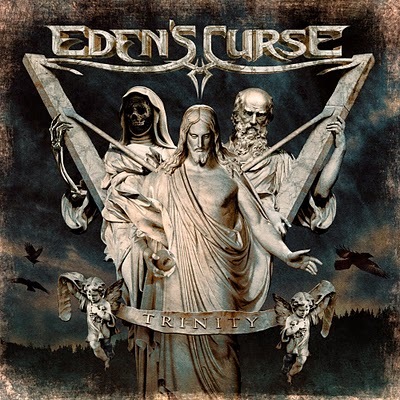 “Trinity” marks the third strike from melodic metallers Eden’s Curse who to be honest are an outfit I’ve always had a hard time getting into. Granted they have never delivered a stinker but on the flipside never really produced anything above average to these ears. So it was with a little trepidation I approached “Trinity”. Fortunately this is easily the best work to date from the band. Aided by a strong production from Dennis Ward (who rarely fails to deliver the sonic goods), “Trinity” is a general cruise through enjoyable tracks with a keen sense of melody and upbeat delivery. Vocalist Michael Eden will always be an acquired taste and his voice again doesn’t blow me away with its shaky pitch and lack of depth in vibrato; but he can pen a decent hook as exemplified on the standout cuts such as the title track, “No Holy Man” (with guest James LaBrie), the storming euro metal of “Dare To Be Different” and the darker Savatage feel of “Jerusalem Sleep”. A tribute to Ronnie James Dio is served up with a cover of “Rock n Roll Children” where it would be unfair to compare vocals between original and cover, yet its a nice addition to the package. 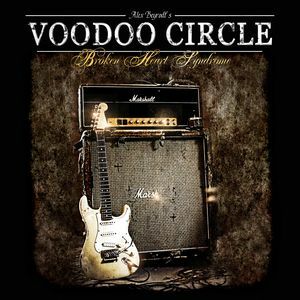 Overall an agreeable release and recommended for fans of melodic metal. Lets hope we get more like this on album #4. This entry was posted in Reviews and tagged AFM Records, Dennis Ward, Eden's Curse, James Labrie, review, Ronnie James Dio, Trinity. Bookmark the permalink. For your weekly dose of sword & sorcery, look no further than Elvenking. 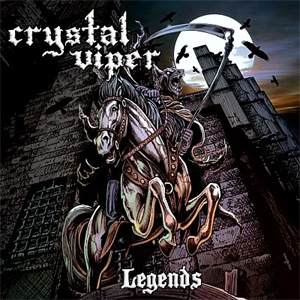 Power metal with light medieval and folky overtones. Yes, there’s the endless rolling bass drum, the guitar fills that come straight from Spinal Tap’s “Stonehenge” and the busy arrangements. But there’s also strong melodies and harmonies and a singer who isn’t straining. Some of the songs are a bit convoluted, but overall the flow is pretty good. 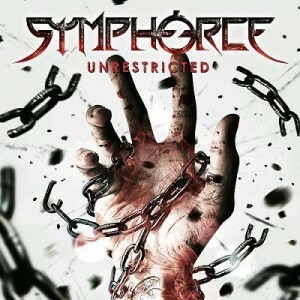 A decent melodic metal album if not particularly original. 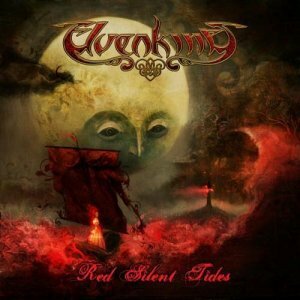 This entry was posted in Reviews and tagged AFM Records, Elvenking, Red Silent Tides, review, Stonehenge, Sword and sorcery. Bookmark the permalink.